Sometimes the bargain bin at my local bookstore has some good finds - other times, it's a total crapshoot. I found Celebutantes in the store's bargain bin, and I should have known better after seeing that Amazon officially sells this novel at a never-changing "Bargain Price." After attempting to read this novel, I totally get why it's officially become a bargain book. I couldn't make it past page 30 of Celebutantes. Celebutantes is written by Amanda Goldberg and Ruthanna Khalighi Hopper. According to the book's back cover, the authors are apparently "two daughters of Hollywood royalty." Goldberg's father is a television and movie producer, and Hopper herself is also a producer. 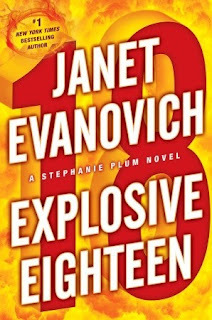 Explosive Eighteen is one of the latest novels to be released in the "Stephanie Plum" bounty hunter series by Janet Evanovich. If you haven't read all of the previous seventeen books in the series, don't worry - Evanovich will provide you with an adequate history and summary of Stephanie's life-situation and aspects of the ongoing plot in every novel. In Explosive Eighteen, Jersey-renowned bounty hunter Stephanie Plum is finally returning home to New Jersey after having spent a mysterious vacation in Hawaii. On the airplane, the man sitting next to Stephanie secretly hides a photograph in her luggage, which Stephanie immediately discards upon discovery. After getting home, Stephanie finds herself being chased by a number of henchmen trying to get their hands on the photograph, which Stephanie now no longer has in her possession. 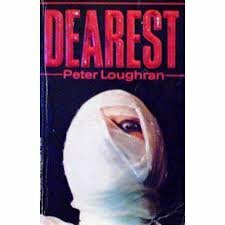 I actually found Dearest by accident (literally) at my local bookstore. While browsing horror novels by Bentley Little, this novel slipped out and fell to the floor. As if the front cover weren't quite creepy enough, the back cover blurbs convinced me to give this novel a try. "He was a taxi driver with very definite ideas about women. The trouble was that no woman - no matter how much he might love her - could ever live up to his expectations. Then he met Jacqui. She was a beauty. Really gorgeous. And after she began to carry his unborn child, and he gave her a ring in the prospect of marriage, he knew he had to take certain steps to preserve her and their relationship permanently." 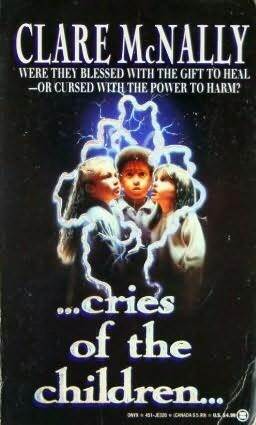 It's been years since I read any horror novels by Clare McNally, and I've missed her! I have fond memories of reading McNally during my pre-teen years spent living in Hawaii, after a new library opened and began carrying fresh and spankin' new copies of all her novels. I've always been a huge fan of McNally. Cries of the Children tells the story of three young children who are left confused, abandoned, and alone in various parts of the country. First, there is 8-year-old Julie, who awakens to find herself in the care of Samantha, a 35-year-old doctor who lives near the Front Range of the Rocky Mountains in Colorado. Then there's Lorraine, a 5-year-old girl who finds herself in New York City alone and with a suitcase full of money, who eventually gets taken in by a homeless woman. Lastly, there is Steven, a 10-year-old boy who is taken in by a close-knit and loving family of four who live in Columbus, Ohio. I've been seeing Luanne Rice's books everywhere for years, and despite her being so prolific, I've never read any of her novels. But - on a recent contemporary romance book-buying binge, I decided to take a break from my other favorite romance authors (Barbara Bretton and Nora Roberts) and take a chance on Luanne Rice. I'm glad I did! Rice is now ranked high on my list of favorite contemporary romance authors. 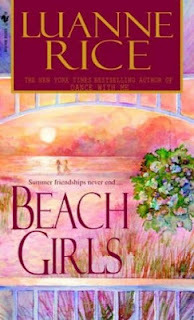 I decided to read Beach Girls this month because its title qualifies for the June reading challenge over here at Bookmark to Blog. "Beach" is one of June's keywords, and of course, what better time to read a beach novel than during the summertime? Virgin Soul is the first novel by Judy Juanita - a celebrated playwright and poet from the California Bay Area. 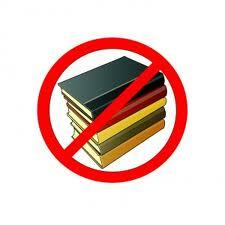 Virgin Soul was provided to me by the publisher, Viking, after they had asked me to review this novel. I agreed to review Virgin Soul because its synopsis sounds exciting, rich, full, and controversial, especially for those interested in the civil rights movement period. The novel takes place throughout the 1960s. 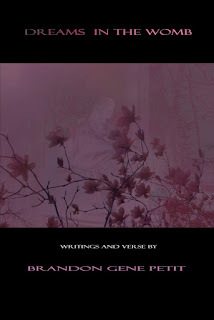 I agreed to review Dreams in the Womb after corresponding with the author - Brandon Gene Petit - on Twitter regarding the power of muses. His quick replies about the topic instantly intrigued me. 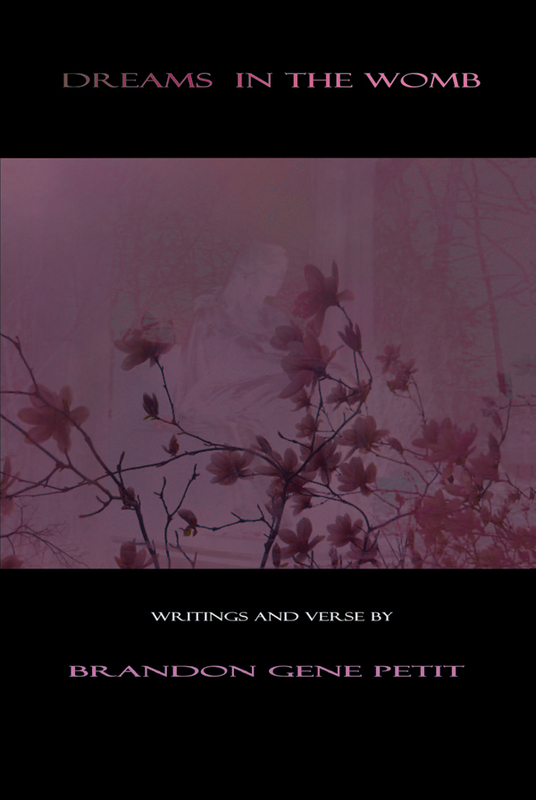 After visiting Petit's website, and reading more about the synopsis of Dreams in the Womb, I decided that I couldn't pass up his volume of poetry and prose, most of which, I soon came to realize, is inspired by one or more muses. After all, dreams are what inspired me to pursue a writing career years ago, so I couldn't help but recognize Petit as a kindred spirit. Like I said - how could I not be intrigued by his work? It took me just a few blissful hours to read Dreams in the Womb. I knew I'd love the book after reading Petit's introduction, which is more like an explanation about the source of his creativity, and in which he says he made the decision to write because he is, "...forever gratefully burdened with the pangs of inspiration."